The default point style is a simple dot, but it’s hard to see. Some disciplines specify a certain type of point style, such as an x, a cross, or a circle. AutoCAD comes with 20 point styles, so you can generally find the one you need. You would usually define the point style first, and then use the POINT command, but if you change the point style, AutoCAD changes the style of existing points accordingly. Choose the style you want. Note that the second style is invisible. By default, the point size is relative to the screen. This means that the point size doesn’t change when you zoom in or out. This type of point is meant for reference. 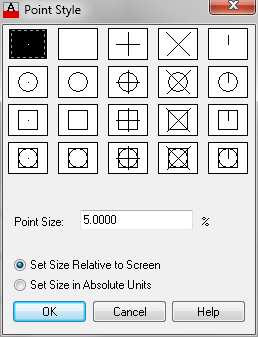 However, if you want to use the point to represent a real-world object, choose the Set Size in Absolute Units option and enter a size in the Point Size text box. Then use the POINT command to insert the points into the drawing. You can find this command on the ribbon, on the Home tab, in the expanded Draw panel. The tooltip says Multiple Points. When you specify a location for a point, AutoCAD continues to prompt you to Specify a point until you press the Esc key on your keyboard. If you don’t want your points to appear when you plot, you can change the point style to the second point style, because it’s invisible. Another option is to put your points on a separate layer with the Not Plottable properly. Do you use them to represent physical objects or just for construction? Leave a comment! Thanks for what was, for me, a refresher. It was a help. Thanks Ellen. I always look forward to your tips and tutorials. Question. Is there a way to set a Point Style as default for all drawings? One place I still use them is in blocks where I need a “snapable” point that isn’t an END or MID, etc. I don’t remember if that system variable is saved in the drawing. But trying setting it and saving as a template; then using the template to create a new drawing. Let me know if it works. Blocks are saved in a template, if the point style is saved and used in one of the blocks then it will be the default when the drawing opens. I have just used points in a slightly different way. I have a very long drawing (about 4 ft. x 13 ft) that I had to plot, and had only an E size sheet (36 x 48) plotter available. I needed a way to past the individual sheets together very accurately, as the drawing was to be pasted on plywood and used as a cutting template. I divided the drawing into a number of sections so that they would overlap by several inches, then, in model space put the points at the top and bottom edges of the printing area. Then, when I went to paper space, I made certain that all of the points were in the printing area. After printing, I decided which sheet was to overlap its neighbor and cut off the non-printing area. This cut is not critical, and can probably be done by eye. Then, I laid the drawings on a soft surface such as Celotex or corrugated cardboard sheets, put waxed paper under the area of the joints, and pushed a straight pin through the cross hairs of the point on the top sheet, and then through the corresponding point on the lower sheet. After I was satisfied that the alignment was right, I lifted one end of the upper sheet and using Elmer’s White Glue, glued them together. Of course, you can use this with any size sheets, and you can make the matrix two-dimensional. can a user have two different point styles within one drawing? I want to use different point size on my paper space and can’t manage to achieve that. any tips would be greatly appreciated. I would like to know whether we can draw different point styles in one drawing. Fedor and LAI TAK CHI… no, you can only set one point style in a drawing. 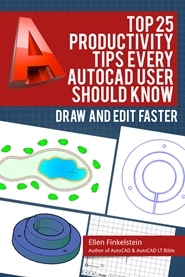 To use a different style of point you would need to create the point with AutoCAD entities (lines, circles,etc.) and then create a block of it. I had my points on the defpoints layer and found the style would not change from the “point”. If on another layer they do change. Any way to make them more visible on defpoints? 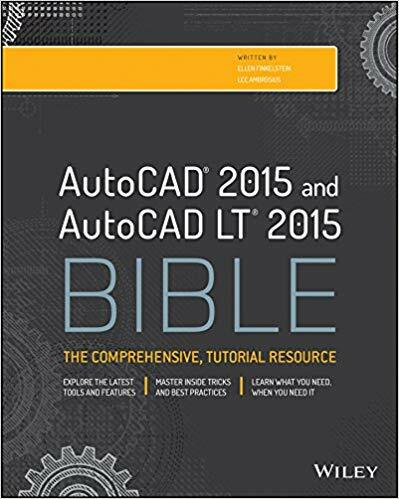 I am using AutoCAD 2015 w/ Microvellum. It doesn’t recognize DDPSTYLE or PDMODE. Is there another way around? Bruce, what version of Microvellum do you have? You can start a support ticket in Microvellum and ask them why you cannot get those commands to work. Microvellum does eliminate Express Tools, but these are normal non-Express commands. They will often connect to your computer (with your authorization) with Teamviewer and show you remotely how to do something. Give it a try. Is it possible to copy drawing with points and change layout of points in just one of them (size, shape,…)?